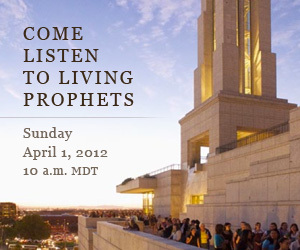 A new resource is now available to help members invite others to watch or listen to general conference. The "Invite Others" page is available on the general conference page of LDS.org and on the Church's official Facebook page. Along with an introductory YouTube video that can be easily shared through several social networking platforms, banners and widgets are also available for those willing to place these on their websites or blogs. 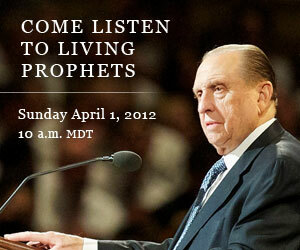 These resources are intended to assist members in inviting all to listen to living prophets. In the April 2011 general conference, Elder Jeffrey R. Holland said, "I ask you to reflect in the days ahead not only on the messages you have heard but also on the unique phenomenon that general conference itself is - what we as Latter-day Saints believe such conferences to be and what we invite the world to hear and observe about them. "Most of our congregation, seen or unseen, is made up of members of the Church. However, with marvelous new methods of communication, ever larger proportions of the audience for our conferences are not members of the Church - yet." Thanks for posting this thoughtful lesson.